A few paddocks stepped over for conservation last week ended up being grazed this week. With the increased feed demand and reduced utilisation during the cold and wet weather, it was decided to hold the round and graze the longer x2 Std farmlet paddocks that still had good quality. 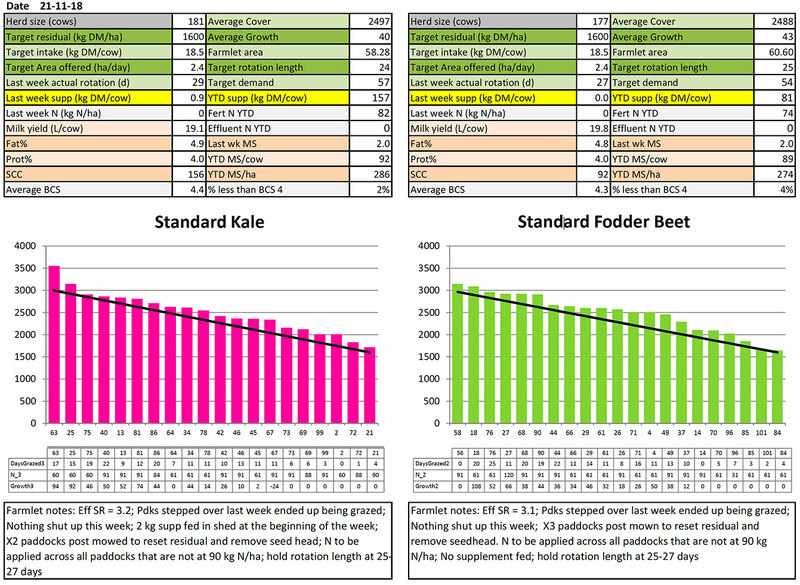 The Std Kale (pink) farmlet was also offered 1kg/cow/day of inshed feeding (50:50 PKE:Barley) over Monday/Tuesday due to the lower cover of the paddock to be grazed. x1 paddock from each of the LI farmlets have been identified as a surplus this week and stepped over for baleage which we hope will be harvested within the next 7 days. Fertiliser will be applied to all Std. farmlets that have not reached 90kg N/ha. Paddocks already at 90 kg N/ha will not receive N at this stage. We require at least 50 units of our 200 kg N/ha limit for late summer early autumn application to extend the rotation and achieve dry off APC targets so need to be strategic with N use over the next 4 months. After speaking with David Chapman, Principal Scientist at DairyNZ, it was recommended to hold off N application to LI farmlets until after heading as it would be the most beneficial for the ryegrass plant at that stage to help with . tiller development. A challenge with the Hub is that the cultivars across the farm have a range of heading dates. The decision has been to continue monitoring pastures and growth rates on the LI farmlets, and to hold off N application while they are growing at or above demand. Tractor work continues this week on farm. The remainder of the FB has been sown in the grass to FB paddocks and pre-emergence sprayed on. FB to FB paddocks have struck well and will receive post-emergent spray when conditions allow. Seed beds in the grass to kale and crop to kale paddocks are currently being prepared and will be planted at the weekend. The need for post-graze mowing of paddocks has been assessed on a case by case basis. The decision criteria used is: does the paddock need to be mown to reset the residual and improve the quality of regrowth or would the mowing just be for cosmetic reasons. If the answer is cosmetic it is not mown. This week x2 Std Kale paddocks were post mowed, x3 Std FB, x2 LI FB and x3 LI kale. The rainfall of 38.6mm this week had the Makarewa River running at peak flow of 125 cumec’s at 8am on the 21st November. This backed the creek up running through SDH with some minor flooding. The crop to new grass paddocks have come away nicely, however the presence of Redshank was noted in a couple. We are reluctancant to spray a new grass paddock where the spray may be harmful to the cultivars sown. 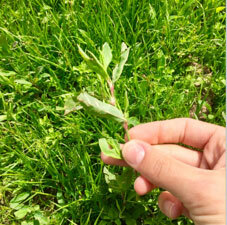 We will use agronomy advice and will monitor weed content up to the first grazing. The paddock will be grazed, topped and reassessed.If we get consistent new grass growth we hope the pasture will get on top of most of the weeds. If however the weeds get on top of the pasture spraying may have to be used to control. A range of cultivars were planted at the Hub during the conversion and where new grass had already been established following winter cropping by the previous owner the pastures were not renewed. As a result some paddocks are an amalgamation of 2 original paddocks and have 2 cultivars. The image below is one such paddock where there is a difference in heading date between the two cultivars and this is resulting in very different looking pasture under the same grazing management and environmental. conditions. Muck spreaders will be out this week to spread the solids from the weeping wall. It will be spread evenly across the same number of paddocks at the bottom of each farmlet feed wedge but not on the forage value index (FVI) paddocks as we need to treat all these the same. Special consideration will be taken for the saturated soils to minimise any risk of faecal contamination into the waterways should another heavy rainfall event occur post effluent application. Paddocks close to waterways will not receive these solids. The cows were body conditioned scored this week. 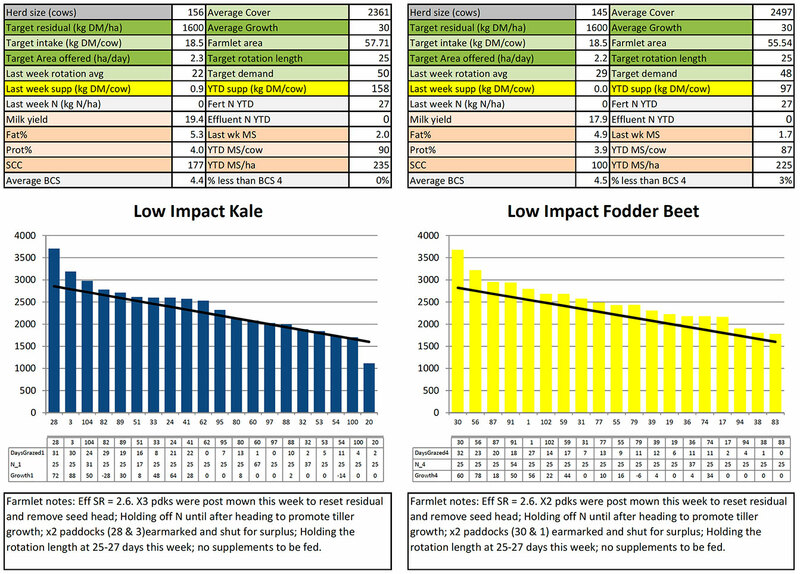 Compared to 2 weeks ago, the Std Kale has remained at BCS 4.4, the LI Kale has lost 0.1 BCS, the Std and LI FB have both gained 0.1 BCS. Although the weather has not been favourable this week, cows are still cycling well and on track with submission rates. There has been a slight rise in SCC of the kale animals this week from 144,000 to 174,000; a clinical mastitis animal was identified and is now on treatment; there were 2 more milking’s of the staph cows into this vat this week which may have contributed to the increase. Calves have been showing signs of photosensitivity which was concluded as possible early stages of spring eczema. X5 calves worst affected have been put in the calf shed, out of the sun, and are being treated with anti-inflammatory drugs and teat ointment. John Greer (DairyNZ) and Lynsey Stratford (PeopleMad) were on farm this week interviewing the farm team as part of a trial run of DairyNZ’s new initiative – Workplace 360. SDRF is looking to explore the use of a shared role with milk harvesters for some milking’s to free the farm team up for normal daily tasks. The farm team role includes assisting the research tech team’s duties like weighing, measuring and sampling where required. This is part of the interesting work here at SDH that the farm team can be part of and we are looking to ensure this continues without interfering with normal farm requirements. A milk harvester would free up one person for other duties once a day. We are working with some potential employees for these positions to see what suits.